Today’s post is a standalone item. It’s sort of one of those things that will just never have a good counterpart, but must be shared. I mean, seriously? I guess no one at Thomas’ English Muffins knew that offering to make someone breakfast is shorthand for, “I’ll be spending the night... after we do it.” The look on Emeril’s big fat face pretty much says it all. And who needs that image in their head? Throw in a few of his signature catchphrases and you’ve pretty much seared the optic nerve right out of your mind’s eye. 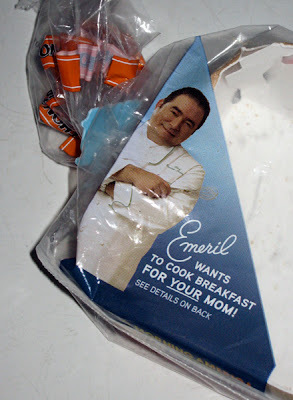 And yes, I realize this post is basically applying Rule 34 to Emeril. Sorry about that.